There aren't a lot of examples of JBoss Modules out there, so let's create a simple Hello World program. I was looking for the simplest "Hello World" example and couldn't find it. Well, why not create one myself then? A surprising fact is that you won't find JBoss Modules in the list of upstream projects at jboss.org. The first option is to download the jboss-modules.jar from Bintray or Maven Central. And the second option is to build it from sources. Oh, OK, one more option (not the best one) is to download the application server that includes jboss-modules.jar, e.g. WildFly. So to mimic the modules we first have to compile both classes and assemble corresponding JARs. Plus, a proper directory layout is expected by JBoss Modules to resolve the artifacts. The main class belongs to the 'app' module, and Hello class belongs to the 'hello' module. Each module requires module.xml descriptor. This part is somewhat documented actually. 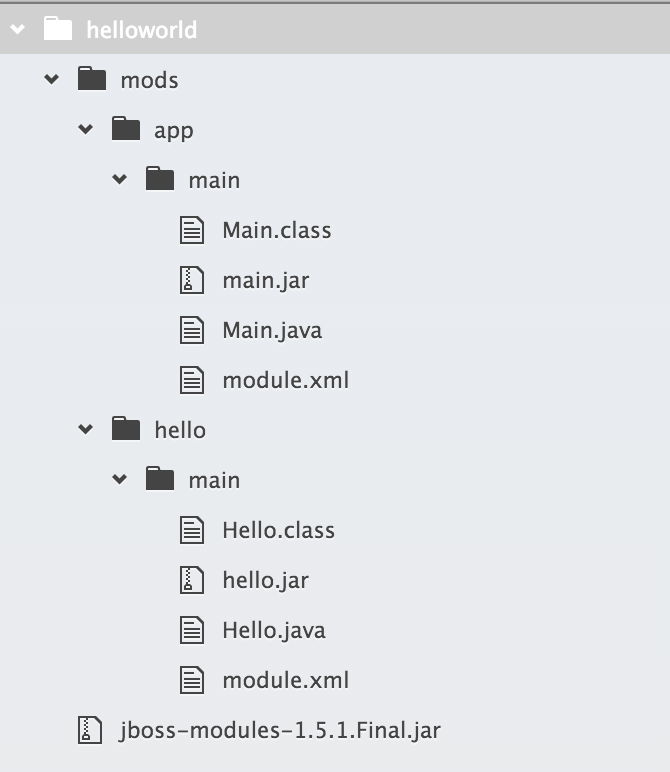 Also the 'main' directory that you see within each module's directory structure is actually a version (!). A version slot identifier is an arbitrary string; thus one can use just about any system they wish for organization. If not otherwise specified, the version slot identifier defaults to "main". It specifies the main class (i.e. Main), the reference to the actual JAR that will be used in this module's classpath, and a dependency - the 'hello' module. The format for the command is as follows. 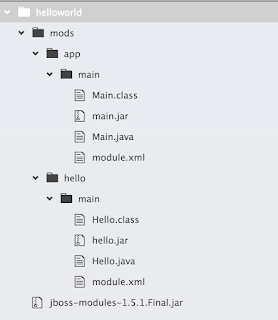 First, java -jar jboss-modules.jar is used to bootstrap the environment; -mp mods, and the 'app' parameter is the name of the application module that should be executed. This example isn't really practical, but at least it gives a hint on how to get started with JBoss Modules. Hopefully, one day, the documentation for this awesome project will be complete and there will be a few more tutorials for different the use cases. Published at DZone with permission of Anton Arhipov , DZone MVB. See the original article here.